A sanctuary away from the hustle and bustle of the everyday world. Everyone deserves to be pampered from time to time. Leave your cares and stresses behind when you walk into the friendly and calming atmosphere of No.13 The Beauty Avenue, tucked away in Potts Point. Owned and operated by Tilly Barnett who has more than 15 years experience No13 The Beauty Avenue high-end salon is all about client well-being and results offering customised treatments and serves for all clients. Call us and experience true luxury today. “thank you so much for being such a big part of my wedding. I had no idea how your treatments were going to become such an important and special part of the journey. The wedding preparations were quite full on but knowing that I had some appointments booked in to come and slip between the big comfortable quilt and be pampered were a highlight, I loved it. Your professionalism and attention to detail was amazing. Thank you for making me feel special. It made me feel so much more confident on the day as well. Please fill out the below form for all enquiries or booking requests and one of our therapists will be in contact with you. Everyone deserves to be pampered from time to time. It’s important to take that “me” time, to reflect and focus on yourself, to unwind and relax. A facial should leave help you leave your cares and stresses behind, and when you walk out of the salon you should feel refreshed and renewed. It should be done in a friendly and calming atmosphere, in a sanctuary away from the hustle and bustle of the everyday world. 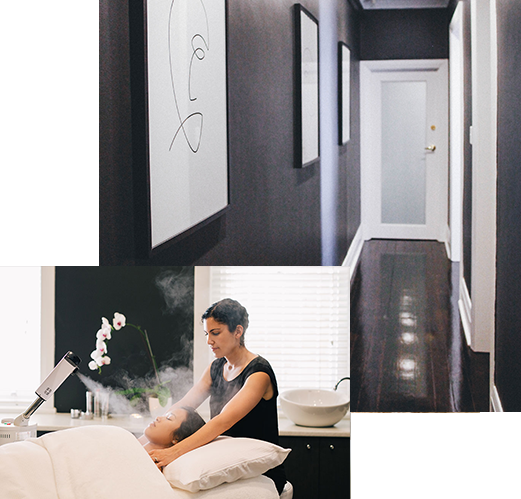 At No.13 the Beauty Avenue, we offer a range of facial treatment packages from a welcoming team, tucked away in Potts Point. No.13 The Beauty Avenue is located in Sydney’s beautiful Potts Point, and is owned and operated by Tilly Barnett who has more than 15 years’ experience within the beauty and spa industry. Tilly noticed a gap in the market for a full-service luxury beauty salon and went on to create her own successful business that offers customised treatments and services for all clients. We only use the best products in our treatments, so you know you’re getting the best when you come to us. This high-end salon is all about client well-being and results, specialising in healthy glowing skin, indulgent massages and impeccable nails. With an extensive service list which includes facials, lash extensions, waxing and tanning, Tilly’s attention to detail and professionalism means that with each visit your skin and beauty needs will be taken care of to the highest degree. If you’re ready to treat yourself, then it’s time to choose a salon that really cares. Our salon offers ambience and quality treatments wrapped up in our facial services. If you’d like more information about our treatments, feel free to give us a call on (02) 9361 5550 and we can chat with you about your options. If you’re seeking a facial around the Surry Hills, Potts Point and Double Bay areas of Sydney, pop in to No.13 the Beauty Avenue today.